Depending on the sport mode you have selected, your Suunto Ambit2 allows you to record various information during exercise. If you are using GPS while recording a log, Suunto Ambit2 will also record your track and you can view it in Movescount. When you are recording your track, the recording icon and the GPS icon are shown on the upper part of the display. 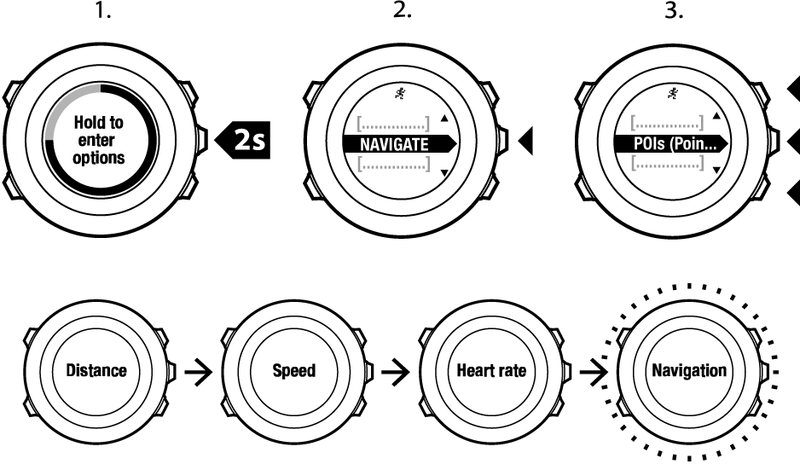 During your exercise, you can make laps either manually or automatically by setting the autolap interval in Movescount. When you are making laps automatically, Suunto Ambit2 records the laps based on the distance you have specified in Movescount. Your Suunto Ambit2 stores all your movements in altitude between the start and stop time of the log. If you are engaged in an activity in which your altitude changes, you can record the altitude changes and view the stored information later. By default, altitude measurement is based on FusedAlti. For more information, see FusedAlti. Make sure that the Altimeter profile is activated. Press Next to select Exercise. Scroll the sport modes with Start Stop or Light Lock and select a suitable mode with Next. Wait for the device to notify that the heart rate and/or GPS signal have been found, or press Start Stop to select Later. The device continues to search the heart rate/GPS signal. Press Start Stop to start recording the log. Most of the sport modes allow you to set your altitude manually during exercise. Scroll to Altitude with Start Stop and select with Next. You can add an interval timer to each custom sport mode in Movescount. To add the interval timer to a sport mode, select the sport mode and go to Advanced settings. 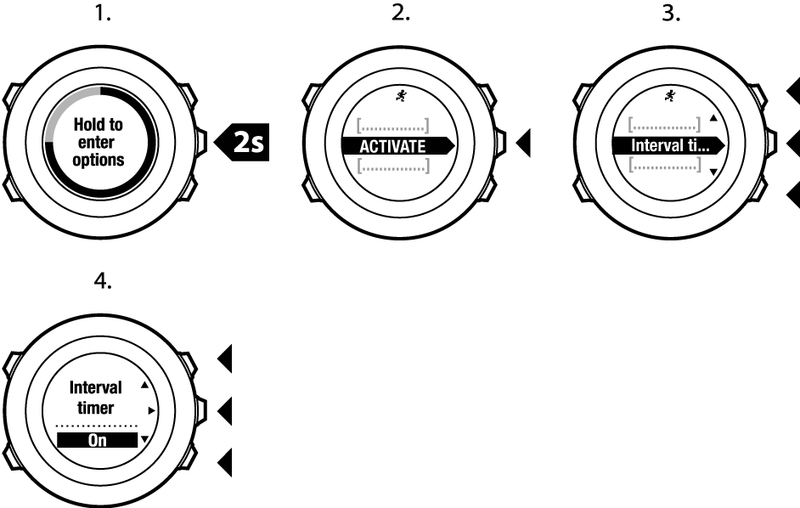 The next time you connect your Suunto Ambit2 to your Movescount account, the interval timer will be synchronized to the watch. If you do not set the number of repetitions for the intervals in Movescount, the interval timer will continue until it has been repeated 99 times. Press Start Stop or Light Lock to set the interval timer On/Off and accept with Next. When the interval timer is active, the interval icon is shown on the top of the display. If you want to run a route or to a point of interest (POI), you can select the respective default sport mode (Run a Route, Run a POI) from the Exercise menu to begin navigating immediately. 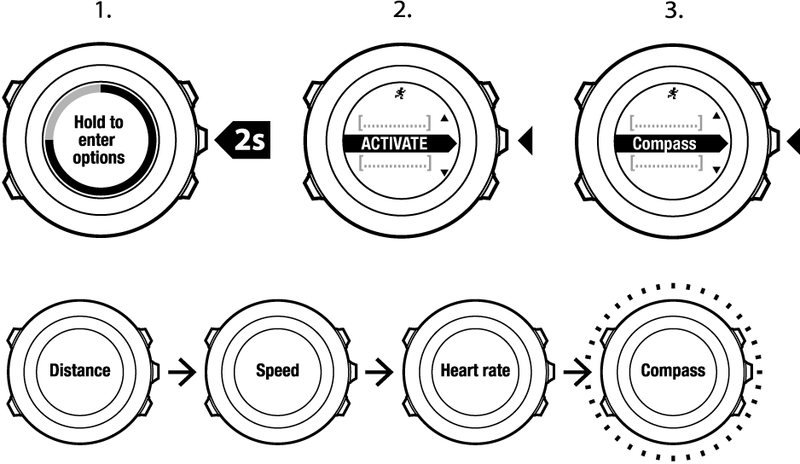 Suunto Ambit2 automatically saves the starting point of your exercise, if you are using GPS. 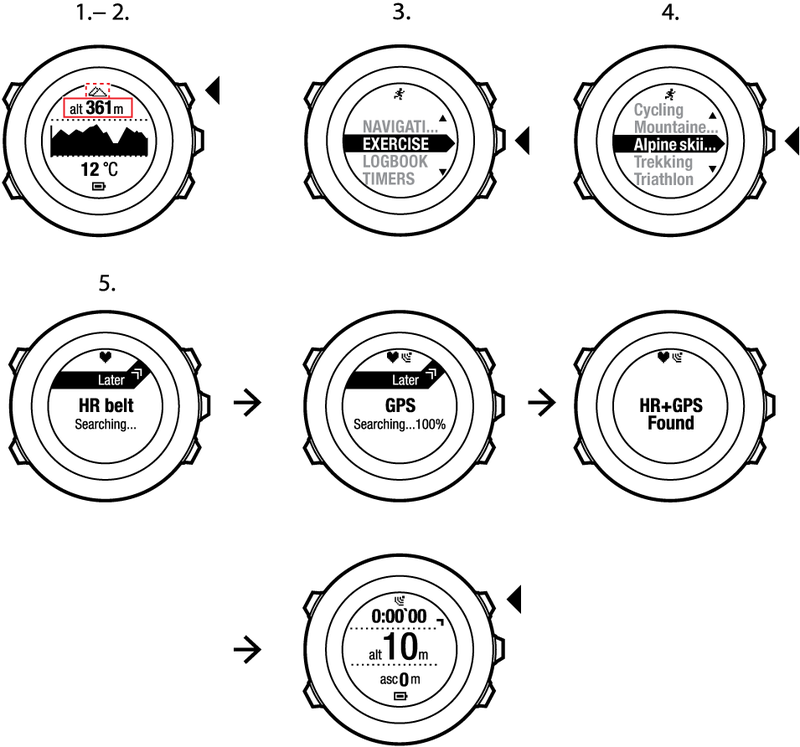 During exercise, Suunto Ambit2 guides you back to the starting point (or to the location where the GPS fix was established) with the Find back functionality. With Track back, you can retrace your route at any point during an exercise. 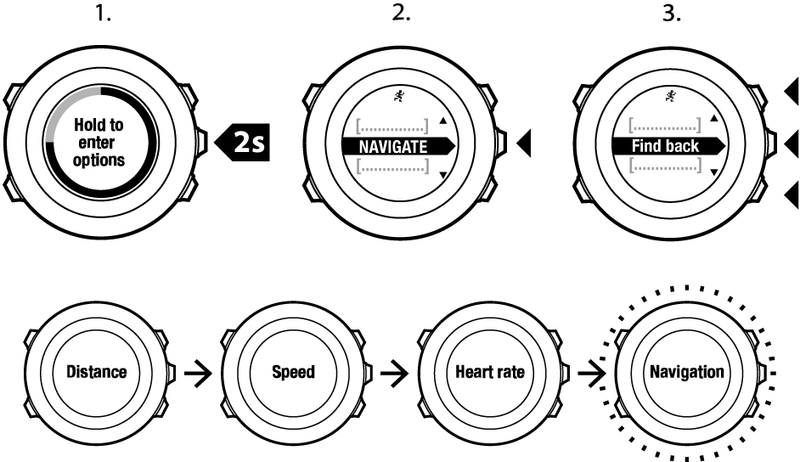 Suunto Ambit2 creates temporary waypoints to guide you back to your starting point. You can now start navigating your way back the same way as during route navigation. For more information about route navigation, see During navigation . Autopause pauses the recording of your exercise when your speed is less than 2 km/h. When your speed increases to more than 3 km/h, the recording continues automatically. You can set autopause to on/off for each sport mode in Movescount. Alternatively, you can activate autopause during exercise. Press Start Stop or Light Lock to set autopause On/Off and accept with Next.